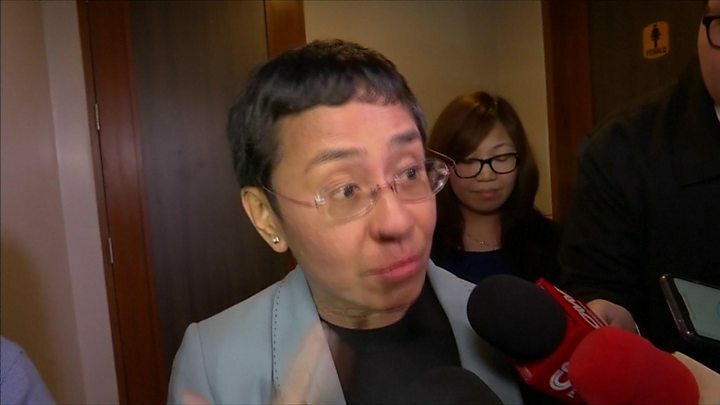 Maria Ressa has been accused of “cyber-libel” over a report on a businessman’s alleged ties to a former judge. Press freedom advocates see this as an attempt by the government to silence the news organisation. President Rodrigo Duterte has previously denied charges against her are politically motivated. This is the latest in a string of different allegations against Ms Ressa, whose website has been described as “fake news” by Mr Duterte. The latest charge against Ms Ressa stems from a seven-year-old report on a businessman’s alleged ties to a former judge in the Philippines’ top court. Officials first filed the case against her in 2017, but it was initially dismissed by the NBI because the one-year limit for bringing libel cases had lapsed. However, in March 2018,the NBI reopened the case. This arrest comes just two months after Ms Ressa posted bail on tax fraud charges, which she says are also “manufactured”. If she is convicted of just one count of tax fraud, she could serve up to a decade in prison. The cyber-libel charge carries a maximum sentence of 12 years. Speaking to reporters after her arrest, the veteran journalist said she was “shocked that the rule of law has been broken to a point that I can’t see it”. Footage streamed on Facebookshowed plain-clothes party officials speaking with Maria Ressa, while several of the site’s journalists live-tweeted what was happening. Miriam Grace Go, Rappler’s news editor, latertweeted that NBI agents had led Ms Ressa out of Rappler’s offices. After the arrest, the site’s staff had focused their efforts on finding a judge who would allow her to post bail, despite it being the evening. However, reporter Sofia Tomacruz tweeted that the judge had refused their request, meaning that Ms Ressa will have to spend the night in jail. Chay Hofileña, Rappler’s head of investigative journalism, had told BBC News that this was their main concern. “Maria is currently at the National Bureau of Investigations, and we’re hoping that she’ll be able to file bail tonight, so that she won’t have to spend the night there,” she said. Ms Hofileña added that “if she’s able to post bail, then she’s free” and they could focus on their case and the legal process. Journalists must “hold the line” against government attacks, that’s what Maria Ressa told me when I interviewed her recently about press freedom in the Philippines. She says politically-motivated legal cases and online troll attacks are being used to try to “bludgeon the media into silence”. Journalists, including myself, have been at the sharp end of numerous threats by supporters of President Rodrigo Duterte. One post under a Facebook link to a documentary about the president read: “Howard, watch your back”. Next to it was a skull and cross bones emoji. The president’s supporters accuse Rappler and other news organisations of being biased against him. They say too much attention is paid to his bloody drug war and not enough to his other achievements while in office. With multiple cases against Maria Ressa and Rappler, long-drawn-out local court hearings are expected. But with Time magazine awarding Maria Ressa Person of the Year 2018 for her journalism, the world’s eyes will be on the Philippine justice system to see which way it rules. Rappler was founded in 2012 by Ms Ressa and three other journalists. Since then it has become known in the Philippines for its hard-hitting investigations. In particular, Rappler has published a number of reports critical of Mr Duterte’s war on drugs, in which police say around 5,000 people have been killed in the last three years. In December, it also reported on his public admissionthat he sexually assaulted a maid. The president insists that the site’s reporting is “fake news”, and has banned its reporters from covering his official activities. Last year,the state revoked the site’s licence– but Mr Duterte denied that the claims against Rappler and Ms Ressa are politically motivated. Ms Ressa says the arrest is an attempt to silence Rappler’s journalism. She has won many international awards for her reporting, and was named a Time Magazine Person of the Year in 2018 for her work holding power to account in an increasingly hostile environment. What does this mean for journalism in the Philippines? The National Union of Journalists of the Philippines has been swift in its condemnation. Meanwhile, Rappler’s reporters have been tweeting about the arrest with the hashtag #DefendPressFreedom. Observers say that press freedom in the Philippines – once one of the strongest in Asia – has been weakened under Mr Duterte’s presidency. Since 1986, 176 journalists have been killed in the country, making it one of the most dangerous in the world for reporters. In 2016,the president was criticised for saying some of those journalists deserved to die.